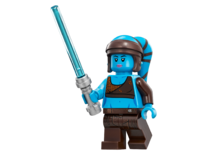 Aayla Secura is a minifigure from the Star Wars theme introduced in 2010. 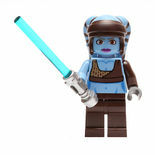 The Aayla Secura minifigure has a plain dark brown leg piece, with a light blue torso piece. Dark and light brown printing with black outlining is used on the front of the piece to represent Aayla's clothing, and blue printing is used to outlining the shape of her body. The back of the torso is also printed, extending on the design on the front. Aayla's right arm is blue and her left is dark brown, reflecting the one-sleeved top she wore during the Clone Wars. Her hands are dark grey, portraying gloves. Aayla's head piece is once again light blue for her skin tone, and has white, brown and black printing for eyes, black printing for eyelashes and mouth, grey printing for eyebrows and eyelids, and pink-purple printing for lips. On top of the headpiece, Aayla has a piece for her lekku or "head-tails". The piece is light blue, with dark brown printing to represent the clothing Aayla wears over her lekku. Aayla comes armed with a blue-bladed lightsaber with a silver hilt. Aayla's first appearance in LEGO was as a video game character in 2007, in LEGO Star Wars: The Complete Saga. This version of Aayla was similar to her physical variant released three years later, but her skin tone was greener and her clothing was a lighter brown. There was also less detailing on her torso, and her lekku were plain blue. In the game, Aayla was able attack with her lightsaber, perform a double-jump, and build and attack enemies by using the Force. Aayla's character icon in LEGO Star Wars III. In 2011, Secura once again appeared in a video game, LEGO Star Wars III: The Clone Wars. This time around, Aayla's design was based upon her physical variant, but she has dot-eyes with eyelashes as opposed to her The Clone Wars styled eyes. Another noticeable difference between her video game character and physical variant is that both arms are blue. In the game, Aayla can once again attack with her lightsaber, double-jump and use the Force, but can also cut through certain walls with her lightsaber, perform a lightsaber throw, and jump up certain pairs of walls by burying her lightsaber one wall and leaping to the other. Aayla is a story character in the levels "Jedi Crash" and "Defenders of the Peace". Aayla Secura was a Rutian Twi'lek Jedi Master (and onetime apprentice to Quinlan Vos) who served during the Clone Wars. She fought in several battles, including one which helped to free a small Lurmen village from destruction, and also fended off the Zillo Beast during its rampage on Coruscant. She had mutual feelings for fellow Jedi Kit Fisto, but they chose not to pursue their feelings and to remain Jedi. She was one of the few Jedi who developed a strong bond with their Clone Commander, she and Commander Bly shared a mutual trust and respect. She was serving on Felucia when Order 66 was executed, where she was shot in the back and killed by Bly and another member of the 327th Star corps. Aayla in LEGO Star Wars: The Complete Saga.